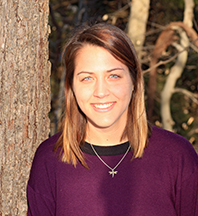 Whitney joins The Woods after several years of teaching and conducting research in the fields of conservation. 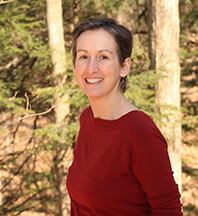 She holds a Ph.D. in Environmental and Natural Resource Policy from SUNY-ESF. Growing up in Western New York, Whitney was an early explorer of all things outdoors and over the years has continued to connect with the environment through her work as a science educator, camp counselor, and naturalist. 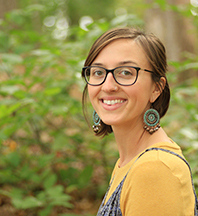 A firm believer in the “hands-on, minds-on” model of connecting people to nature, she is excited to work with the Baltimore Woods community to promote the true power of place right here at home in Central New York. Whitney is an avid volleyball player, hiker, and traveler and looks forward to meeting you at The Woods! 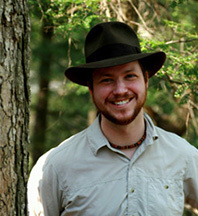 Tom graduated from SUNY-ESF in 2001 with a BS in Environmental Forest Biology and Forest Resources Management. He has been a counselor, naturalist, and director at various Boy Scout and Environmental Education camps for the past 20 years. Tom has many hobbies and skills, chief among them are playing banjo, guitar and mandolin, nature photography, and fly fishing. He spent his childhood playing in the woods, fishing in farm ponds, skipping rocks, building forts, camping, backpacking, and forming a deep connection to the natural world. As Camp Director at Baltimore Woods since 2007, he has been passionate about providing those same opportunities for hundreds of local children as they play and discover and build their own nature connections. 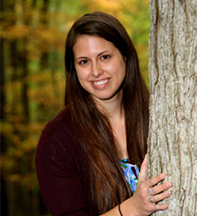 Becky graduated in 2008 from SUNY ESF with a Bachelor of Science in Natural History and Interpretation. 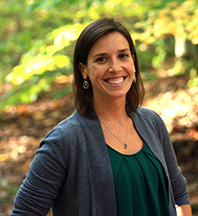 She has been working at Baltimore Woods Nature Center since 2010 and is passionate about connecting children to nature. Becky loves spending time hiking and camping with her husband and two sons, Sage and Reed. She enjoys sharing her love of nature with her boys and is inspired by their awe and wonder of the world around them. Melissa graduated from SUNY- ESF in 2016 with a B.S. in Environmental Biology. Her love for the natural world has fueled her passion to help others connect to nature in a personal way and see the beauty all around us. In her spare time, she can be found exploring in the woods, probably looking for interesting fungi and wild edible plants. 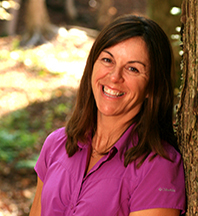 Melissa loves working with children, encouraging their natural curiosity and sense of wonder with the outdoors. She is excited to be part of the Baltimore Woods community. Allie graduated from SUNY-ESF in 2015 with a B.S. in Conservation Biology. She started working at Baltimore Woods in the spring of 2016. Allie is passionate about bringing hands-on Nature in the City science programs into the Syracuse City Elementary Schools. Watching the students’ interest in science and the world around them grow throughout elementary school is something Allie is excited to be a part of. When Allie is not in the classroom or at the nature center, she loves to get lost in a good book, find a new craft project, or perfect a recipe in the kitchen. Brenna graduated from SUNY-ESF in 2017 with a B.S. in Environmental Studies. Growing up on the outskirts of the Adirondack Park inspired her to view the natural environment as her personal playground. She is interested in bridging the gap between youth and the natural world, especially in urban areas, which is why she is so passionate about delivering our Nature in the City program to Syracuse City School District students. Through her teaching, she hopes to provide children with an opportunity to feel comfortable and confident, especially when it comes to exploring our environment and learning about science. 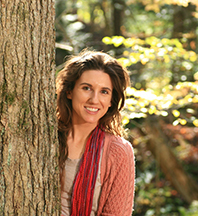 Brenna enjoys painting, writing poetry, gardening, and sharing her love of all things wild with her son, Leo. Lexi graduated from SUNY-ESF in 2018 with a B.S. in Environmental Biology. 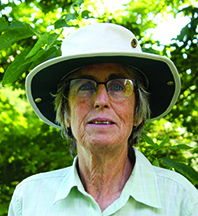 She grew up on an apple farm, where she was able to explore, play, and forge lasting connections with the environment. Lexi hopes to create opportunities for all ages to enjoy nature, both at The Woods and through the Nature in the City program. She is always learning from those around her and loves sharing memories of experiences in nature. Lexi likes to cook with her family, put her nose in a good book, or go on a grand adventure in her spare time. A native of Central New York, Stacy returned to the area after many years of traveling with her Navy husband. She is the mom of three growing children. She holds an MBA from St. Joseph’s University and a BA in English/Communications from Le Moyne College.She is passionate about the arts, a steward of the planet, and a staunch believer in the Golden Rule. Meg has a BS in agriculture from Cornell University and has operated a small farm in Central New York with her family since 1999. 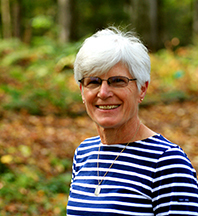 She served as a board member of the New York Agricultural Land Trust for 10 years, and she is passionate about preserving green spaces and connecting people to the land. She is currently pursuing an MPS in environmental studies at SUNY-ESF, and she has been a Kripalu yoga teacher since 2013. Meg enjoys baking, walking with her dogs in the woods on her farm, and exploring the Finger Lakes with her husband and son. She looks forward to connecting with members of the Baltimore Woods community! Office Manager for Baltimore Woods since 2011, Sue Jones enjoys welcoming visitors to The Woods, both young and old, and working with our many wonderful volunteers. When she is not at The Woods, Sue enjoys walking her dog, kayaking, working in her garden, and spending time with her grandchildren. A graduate of Wells College, Sue serves on the Tree Committee for the Village of Skaneateles and is a big fan of farmers markets. A native of Quebec, Gaetane moved to New York State in 1989 to follow her American husband. She studied accounting at Jefferson Community College and Empire State College. 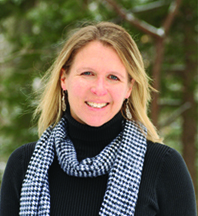 She is an avid cross country skier, hiker, and cyclist. She is an animal lover and has rescued many dogs and cats over the years. An outdoor enthusiast, she loves hiking at The Woods in all seasons of the year! 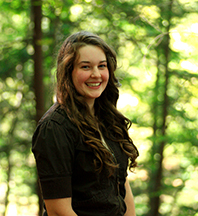 Rebecca is a Senior at SUNY-ESF where she will graduate in the spring of 2019 with a B.S. in Environmental Studies. 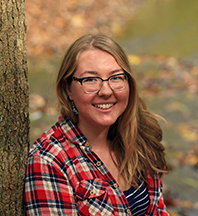 Rebecca joins the team as Program Assistant after her time working with youth through AmeriCorps in Vermont and as a Nature in the City and summer intern. She spent her childhood summers on Lake Chautauqua with her family exploring the water, picking black raspberries, enjoying the wildlife and playing games with her cousins. With a passion for stewardship and youth development, Rebecca is excited to be part of an organization and community that supports exploration and appreciation for the natural world for all ages.